The Swedish Colonial News is the official newsletter of the Swedish Colonial Society. This publication recently celebrated its 10-year anniversary by adopting a new masthead and layout format, starting with Volume 2, Winter 2000. 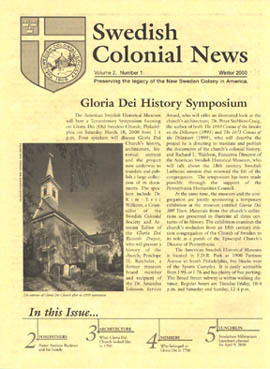 The Swedish Colonial News is mailed to all Society members and contains the Governor's Message, articles about historical events and buildings related to the New Sweden Colony, Forefather family profiles with descendants listed, notes of current, new and deceased members, photos of recent Society celebrations, and news of upcoming events of interest to Society members and the Swedish and Finnish community.